Sakhi ( Guru Nanak and Bebe Nanaki ) Bebe Nanaki, the esteemed sister of Sri Guru Nanak Sahib, never sent telegrams and letters to her brother. Her loving remembrance was enough for instant response by the most adorable and lovable Sri Guru Nanak Sahib. True prem, True love cuts across all the barriers and limitations of time and space. When Guru Nanak Dev ji was going away on one of the Udaasii’s, Bebe Nanaki asked Guru Nanak how will I live without seeing my dear brother? Guru Nanak Dev Ji replied, ‘O dear sister, whenever you shall think of me I shall come to visit you’. Once When Bebe Nanaki ji was making parshade’s (roti’s) one night, “Parshada full gaya” ( sorry don’t know how to say it in English!!) and she remembered how Guru Nanak ji loved ” fulle hoye parshade” she just thought how I wish my brother would come to eat this rotis I am making. Right at that very moment Guru Nanak Sahib ji walked in and said I’m so hungry. 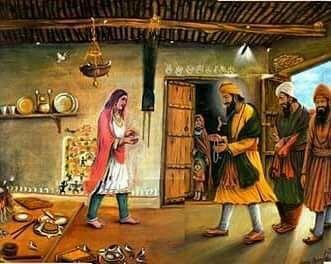 Guru Ji graced her with his presence and had the roti’s she had made with so much pyaar. Nowadays we communicate to people through mobile phones and by textmessaging one another. It is expected that if you send a text message to a good friend, that he or she will reply to your text message. Now if we text messaged Vaheguru, then we would expect Vaheguru, who is our friend, our companion or beloved, to text back. Simran is a form of text messaging on a spiritual level. If we text message Vaheguru, then Vaheguru will definitely text message us back. However, our message can only be received to the person we are sending it to, if we have reception. If our phone doesn’t have any reception, then despite how many text messages we send, the recipient will not receive any of the messages we send. Similarly if we have no ‘pyaar’, love, for Vaheguru Ji, then our Simran will not be counted for and we will not be able to experience the Lord.